The creepy horror novel from Stephen King's son Joe Hill, NOS4A2, will soon see a small screen adaptation premiere on AMC. First announced back in 2015, the upcoming miniseries will finally arrive on the network in Summer 2019. With executive producer Jami O'Brien serving as showrunner, the miniseries will consist of ten episodes. Depending on its success, the show might continue beyond the first season, expanding the mythology first established by the source material. Ahead of the show's premiere this summer, AMC has released several images from its first season, showcasing many of the characters and locations we can expect to see on the new series. An all new teaser was also premiered during the newest episode of The Walking Dead, confirming the show's Summer 2019 release date. Published in 2013, the book NOS4A2 is the third novel to be written by Joe Hill. Its title refers to the vanity plate on the Rolls Royce Wraith driven by the antagonist of the series, Charlie Manx (Zachary Quinto). A supernatural killer similar to a vampire, Manx feeds on the life force of children by transporting them to a place he refers to as Christmasland. This keeps Manx eternally young, while transforming the children into ghoulish creatures. The story focuses on a mother named Vic McQueen (Ashleigh Cummings) who comes to realize she has extraordinary abilities of her own, which she must use to keep her son safe from the sinister Charlie Manx. Previously, AMC had released a first look photo of Zachary Quinto as Charlie Manx, and he looked utterly creepy in the role. The new batch of photos show us a little more of Charlie, as well as our protagonist Vic. Also revealed in the new images are Virginia Kull as Linda McQueen, Ebon Moss-Bachrach as Chris McQueen, and Olafur Darri Olafsson as Bing Partridge. Additionally, the new TV spot teases even more of the upcoming series. Only 15 seconds long, it's limited in what it shows, but the ominous imagery and music is enough to let fans of the source material start getting excited. Joe Hill might be the son of perhaps the most legendary horror author of all time, but he has certainly developed some amazing work of his own. NOS4A2 is the third novel by the writer, and one of his most popular works so far. Another one of his popular titles, Locke & Key, could be coming to Netflix in the future, as it was reported last year that the streaming service was looking to adapt the comic book series. Hill will also be involved in Shudder's upcoming TV series based on Creepshow, so there's plenty to expect to see from the horror author when it comes to the small screen as well. 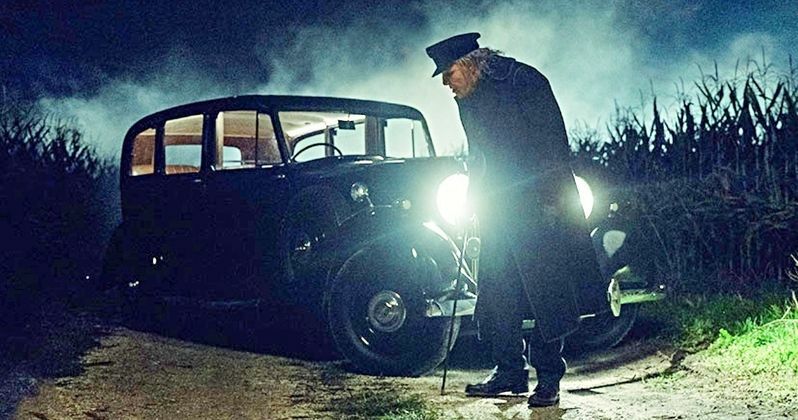 The pilot episode of NOS4A2 will premiere this month at South by Southwest Conference and Festivals in Austin, Texas. We can expect to see the series this summer on AMC. The first look photos come to us from AMC, and you can watch the new teaser below!